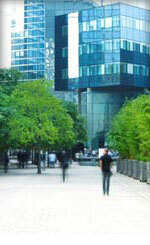 CRES + Associates with their Lead 2 Green initiative will work with you to achieve your corporate real estate strategy. Our team leverages 30 years of extensive experience in commercial real estate to show you ways to manage your commercial real estate cost more efficiently. CRES will recommend ways for you to improve the performance of the real estate you own or lease, while meeting your office sustainability goals. Shell Oil new exploration and production division wanted to lease 25,000 SF in a remote area of North Texas. Shell Oil contracted with CRES to confidentially locate and lease a site for new exploration and production divisions in a remote location of North Texas. Success: The CRES team worked closely with the Economic Development Directors of three small communities to maintain client confidentiality and to gather valuable land, development, zoning, and tax incentive information. Local demographics for each community were provided for the relocating families of management. More than 30 sites were previewed and evaluated for best use and occupancy cost. A purchase vs. lease analysis was performed, and a facility selected for lease. CRES also performed a construction bid analysis and introduced a fourth bidder. Shell Oil realized more than 25% in occupancy cost savings over a three-year lease.